Son of Wolfgang Kilian [1581-1662] and a skilled engraver of old Master paintings. After his apprenticeship, in 1648 he set off on the educational visit to Italy traditional in the family. He stayed in Florence, Venice and possibly Rome, where he reproduced many celebrated paintings in these cities such as Veronese’s Adoration of the Magi (Hollstein, no. 2), Tintoretto’s Woman Taken in Adultery (Hollstein, no. 3), Carlo Dolci’s Salome with the Head of John the Baptist (Hollstein, no.5), Correggio’s Virgin and Child in Glory (Hollstein, no.11) and the Baptism of St Anthony by St Ambrose (Hollstein, no.28) by Giovanni Battista Pittoni. Philipp was keenly interested in French and Flemish painting as represented by the work of Philippe de Champaigne. Kilian engraved the latter's Assumption of the Virgin (Hollstein, no.12) and some of his portraits. He also reproduced the works of a number of German artists living abroad, for example Johann Carl Loth’s Holy Family (Hollstein, no. 13). 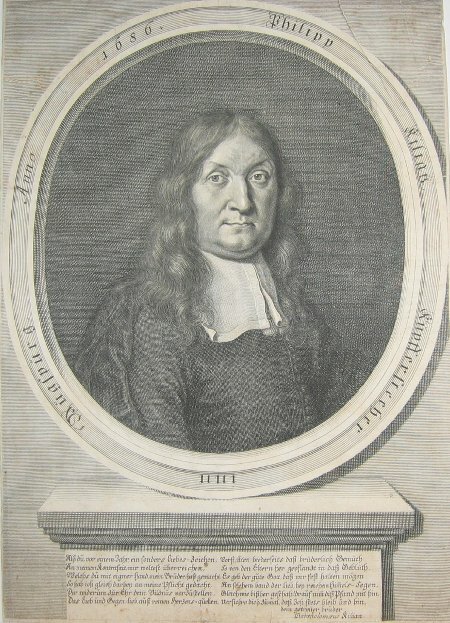 In later life, after his return to Germany, he reproduced works by Johann Georg Knappich and Thesenblätter (literally Thesis sheets) by Karel Skréta. It is not known whether he engraved any maps, as his father Wolfgang had done.